Crossing the causeway to Holy Island is always accompanied by a sense of anticipation, and when I collected Graham and Joan from the Manor House they mentioned that Yellow-browed Warblers had been seen the day before. Checking the bushes and trees in the Vicar’s Garden didn’t produce any sight or sound of the Siberian speciality, but everywhere was heaving with Robins – presumably recent arrivals from the continent – and Grey Plover, Pale-bellied Brent Goose, Bar-tailed Godwit and Grey Seal could be seen, and heard, by turning through 90 degrees from the trees. After checking other suitable spots around the village, and finding a couple of Goldcrest, we crossed to the mainland and down to Bamburgh. Oystercatcher, Turnstone, Curlew, Purple Sandpiper and Knot were around the rocks as Eider and Guillemot rose and fell with the gentle swell of the sea and Gannet and Sandwich Tern plunged into shoals of fish offshore in conditions that wouldn’t have been out of place in mid-June. We made our way slowly back up the coast, taking in vast flocks of Wigeon over the mudflats and a Weasel that responded obligingly to my imitation of a dying mouse (the sound, rather than a visual imitation!). Little Egrets and Shelduck were exploiting the food supply on the exposed mud and we crossed back on to the island…only to learn that a White-tailed Eagle had been soaring high inland of us while we were watching the Weasel 🙁 We headed down to the causeway, to see if the eagle would make a reappearance, as flocks of Sanderling, Dunlin, Knot, Bar-tailed Godwit, Pale-bellied Brent Goose and Golden Plover concentrated on the rapidly diminishing areas of mud above the rising tide and a Peregrine powered across our field of view before it was time for me to cross back to the mainland and head south. Now, you shouldn’t need to read too many of my blog posts to realise that seabirds and cetaceans occupy a special place in my heart, and that I’m in my element once I’m on a boat off the Northumberland coast. Saturday was our annual ‘Whale and Dolphin Cruise’ on Glad Tidings V, out of Seahouses. With 36 participants, including the other NEWT guides (Sarah and Andy), all safely on board we set off down the coast. 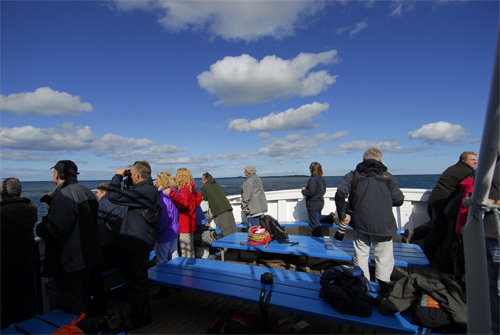 We were soon enjoying views of two Arctic Skuas and then panic on the deck as our eagle-eyed skipper spotted two Sooty Shearwaters off to one side and everyone rushed to see them. These ocean wanderers are one of the great sights of pelagic seabirding in the North Sea at this time of the year. For one participant though the real excitement was the bird sitting beside the shearwaters; a Puffin 🙂 It’s a few weeks too late to see them at their breeding colonies, but I’d told Sam that we had a good chance of coming across one. Throughout the day we found a few more, as well as plenty of Fulmars, Kittiwakes, Guillemots and a few Razorbills. Perhaps the best entertainment of the day was provided by several feeding groups of Gannets, throwing fountains of water into the air as they hit the sea. There was clearly a lot of fish for them to eat, and it was real mystery to myself, Sarah, Andy and John that there were no cetaceans feeding in the same areas. Oh well, if they weren’t so mysterious it wouldn’t be such an adrenaline rush when we do find them I suppose. A lone Manx Shearwater avoided the boat, as they tend to do, and we headed northwards to the Farne Islands, hoping to see the White-tailed Eagle that has been there for the last week. We were in radio contact with other boats so we knew it had just killed a Shag and was eating it. As we neared the islands our one cetacean for the day appeared, a Harbour Porpoise just to one side of the wake of the boat. Just as we arrived, the eagle crept into a cleft between a grassy bank and some rocks so only one or two people managed to get a glimpse of it’s head as it dropped out of sight. Grey Seals were playing, splashing and racing around and we headed back into the harbour, after a marathon effort by our skipper and everyone on board. We’ve already set the date for the 2011 Whale and Dolphin Cruise – Saturday September 10th so put it in your diaries and give us a call on 01670 827465 to book your place. Blue skies, calm sea, what more could you wish for?